I always enjoy starting a wine evening off with bubbly, but 1983 Dom Perignon? What a start to a great evening. The Dom still had medium+ acidity, was well balanced, but had moved beyond nutty to more of a brown butter component. The age on the wine gave it a beautiful texture. For those who have not drunk aged Champagne, the texture can be so gorgeous, it is worth tasting for the mouthfeel alone. The young Veuve Clicquot was bright and bracing as it should be. Out of the bag quite literally… Here are the pics of the bottles out of their paper bags, after we wrote our tasting notes and had attempted to select which bottles matched which producer. Our host served charcuterie, bread and some beautiful pate I really enjoyed to clear/accompany the palate. Very balanced wine, but reaching its limit. Still with medium acidity and medium-minus tannins, this drank reasonably well, but the oxidation had taken over the fruit and was a few years beyond its drinking window. The fruit had moved to more prune and raisin, than fresh fruit flavors. This would have drunk better at around 35 years of age, around 10 years ago. The brownish color around the rim and prune flavors gave it away, almost all of us identified this wine correctly. This wine still had strong tannins. It was a little watery with a very restrained nose and palate. Diamond Mountain region wines in the past have tasted big, tannic, with subdued fruit and without much nuance (IMO)… but with age, developed great mouthfeel. Exactly how this wine tasted. This was an easy tell, with some tasting history to reference. This was the fruitiest of the bunch and had the most obvious oak. This was the surprise of the evening (IMO). Recent vintages of Silver Oak Cab Sauv are not generally viewed as being able to stand up to extended aging, but this 80’s era vintage was balanced and still fruity. A nice wine with tremendous character for 30+ years of age. With the most obvious oak on the nose and palate, this fit the Silver Oak tasting profile, making for a high probability of accuracy. I mistook the next two for each other. I have always had an odd relationship with BV as a producer. I have not really cared for their lower priced wines, having only a minimum of value (IMO), while their famous Georges de Latour release every year is good, but over-priced. They also seem to develop complex flavors in their higher priced wine, some flavors of which I don’t care for. So, I may have gone into this tasting with preconceived notions… which is always an interesting aspect of blind tasting. I guessed this wine was the Joseph Phelps, mostly because I enjoyed this wine as having the most balanced profile of the wines tasted and having the most gorgeous mouthfeel. Frankly, I didn’t think a BV wine could be this good. (buzzer sound) Well, I blew that one! Chalk one up for having a closed mind. I described this one in my notes with the typical wine industry generic term, “food friendly”. The kiss of the death for uninteresting wine in a tasting note in the U.S. This was the most acidic of the bunch. Which was amazing, since this wine was 33 years old. It was a little vegetal with a touch of tomato, but no green bell pepper… both characteristics of under-ripe Cab Sauv. Hard to believe this wine was from a warm vintage. This could only happen in a Napa vintage before 1995. No self-respecting Napa producer would ever harvest Cab this early in a warm year today. I enjoyed this wine the least of the bunch. Poor balance and “interesting”, but not particularly pleasant flavor profile. This was smokey, with medium+ acidity and medium tannin. This was another example of an aged Bordeaux showing balance after extended aging. The flavor profile included an earthiness, that when you taste enough of 1st-5th growth Bordeaux wine, you come to recognize. Still with fresh fruit (blackberry) and stewed currants, the fruit was forward on the palate. I am not a huge fan of Pauillac region wines. I prefer the St. Estephe and Margaux regions in Bordeaux, but this was drinking nicely at 30 years and was a strong representative of Left Bank Bordeaux. This aged, vintage port was exceptional! The fruit had lasted very well. Not too sweet, tasting like a more recent vintage… but for a port, this wine was so balanced… integrated alcohol, good acidity, soft & full mouthfeel. All of us agreed, this was the outstanding wine of the evening. I wish I could hold on to ports this long. This one was worth the wait. Well, there you have it. A great evening! I hope you enjoyed the personal perspective and found insight into blind tasting methodology. I think you can see, blind tasting accuracy is mostly: having tasted a lot of wine labels and being able to hold them in your memory. These were all exceptional wines, wines I would score from 90-99 on the Parker scale. We definitely proved the point, most collectors can easily identify Bordeaux in a line-up of Napa Cabs. All of us guessed the Lynch Bages correctly. Not many are allowed the opportunity to taste a selection of Napa Cabs from the 70’s & 80’s. This was a great experience. I will reiterate comments made before about Napa in the last 30+ years… Prior to 1995 Napa made true Bordeaux style wines: structured, leaner, lower alcohol and well-suited for extended aging. 1995 to 2003 was an interim period, where Napa Cabs were fruitier and more ripe than before, but still able to handle 10-20 years in the bottle. 2004 and after, most of the wine was produced for optimum drinking windows in the 5-10 year range. This is just a gross generality. There are individual exceptions with both shorter and longer aging windows, but in general, I have found this evaluation to hold true. Can an Out of Balance Wine Taste Better Over Time? I was taught that wines made out of balance, never come around with age. Out of balance – always out of balance! When the tannins, acidity, fruit and alcohol are not complementary in a wine, they will all resolve at a similar rate and never be harmonious. I have always selected young wines to age in my cellar by this measure. Bordeaux wine (in particular) can shut down for a year(s) until ready for drinking, but I have never experience something as traumatic as this. This was the last bottle of three, with an interesting personal history. Tasted this wine in the barrel prior to bottling back in 2005. Amazing wine in the barrel. The first two bottles drunk over the last five years were an awful mess. My first experience with a wine this out of balance significantly improving with time. The first two bottles had very noticeable alcohol, extreme acidity and fruit in the background. Apparently, this disjointed wine needed time to come together. Just popped the last bottle and it was beautiful! Fruit forward nose of blackberry, plum and mint. Palate is soft and inviting. Approach is just barely fruit forward following the nose. The alcohol has become integrated and the very high acidity has softened. The tannins have resolved leaving both structure and mouthfeel, without astringency. The fruit persists into a long finish. What was unpleasant before, has flipped a switch and reached its potential. First time I have experienced a mess of a wine coming together over time. It took 13 years of awful tasting wine for this to finally reach its drinking window. I have heard similar stories, but never experienced a radical transformation myself. If you are holding a bottle, this is your time. Let me know if you have had the same experience. I have to wonder, am I drinking a different wine than the others leaving notes on CellarTracker? Take note: you definitely have to be more of a White Burgundy fan, than a Cali Chard fan to enjoy this wine. Conflicting thoughts on this one… This wine is wound very tight, like a Crus Chablis might, without enough cellaring. On the pop, the nose is all bitter key lime, grapefruit and brine. Let the wine rest for 15 minutes and the nose begins to blossom a bit. Definite honeysuckle and green apple comes to play, in addition to the other aromas. Now, the alcohol comes forward – another Cali producer over-doing a white with 14% alcohol. The palate is complex. After 30 minutes, the sweet honeysuckle moves to the front and lime, grapefruit and brine moves to a well-defined mid-palate. The oak is not subtle here, but it adds interest by exaggerating the mouth-feel coming from stirring the lees. The wine almost feels like heavy cream in the mouth. The acid level is high. This could easily age another five years. How would you feel about a 15 year aged Cali Chardonnay? The finish is very, very long with a lightly sweet-sour flavor that persists. This is like a better White Burgundy, missing the finesse. This should be drunk with specific foods to tame its wildness. The acidity would hold up well to the most buttery of white cream sauces I can think of, in fact, linguine in a rich white clam sauce is coming to mind! Drinking window easily until 2022. Still fresh on the nose with plum, blackberry, graphite and a touch of alcohol. First pour, closed with a minimum of fruit. You can tell this wine needs time to open. After 30 mins, fruit-forward with subdued plum, black currant and blackberry and a mid-palate of subtle dark chocolate with a very short finish. The acidity is medium-high, but it is the tannin that is interesting. Softer than when young, although chewy and strangely mouth-filling without being very drying. Not unpleasant, but past its prime drinking window. Great value Napa Cab Blend when young. Losing a couple of rating points with age. Drink-up! As I continue to drink more aged Napa Cab/Cab Blends at all price points, I am able to fine-tune a feel for drinkability and age-worthiness. Hind-sight is always 20/20, but this was a wine meant to drink in a 2012 – 2015 window (3-6 years of age). Looking back, there was not enough balance in the structure to go 10… I am finding the lower cost Napa Cab blends tapping out at around 5 years. The more recent higher quality releases have been hitting a wall at around 10-12 years of age. I have only tasted early 90’s wines that have lasted well, in a 15-20 year window. Beautiful Napa Cab in the middle of its drinking window! Drinking Baldacci Stags Leap Cabs over the last 20 years, I am struck by how they always over-deliver at their price. This bottle cost $46 in 2010 and is drinking like a $70+ Napa Cab! Blackberry and black currant on the nose with tar and leather. Still fruit-forward after 8 years of aging, with blackberry and black currant in front, transitioning to a mid-palate of dark chocolate, leather, underbrush and tar. The wine has a lengthy, slightly hot finish. Gorgeous rich mouth-feel, full and sensuous. The tannins have resolved well and are just under the surface. The acidity is high, but this paired perfectly with a rib-eye steak. Without food, the acidity would have been a bit much. The signature Cab character of graphite and tobacco are missing, but regardless, my wife and I really enjoyed this bottle with steaks for dinner! I decided to stand-up a couple of my favorites for my birthday and decided it would be a L’Aventure night! I am a huge fan of red blends, especially Southern Rhone style. In my opinion, L’Aventure is the quintessential producer in this category in the USA. The winemaker and owner Stephan Asseo is a French ex-pat that moved to the U.S. to make red-blends from the fabulous Terroir on the West Side of Paso Robles. He was looking to escape the French limitations of the AOC laws and he has done it in a big way. 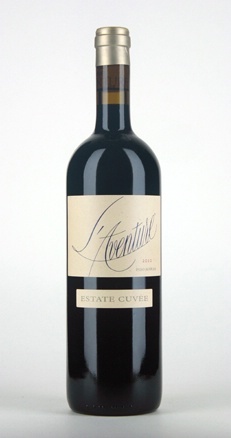 L’Aventure wines capture the perfect balance of the big red Paso profile, while still maintaining elegance and balance. The Estate Cuvee in some vintage years, has easily made it into my top 50 list of best bottles of all time. If you like Robert Parker Jr. picks, you will adore these wines. If you enjoy Stephen Tanzer’s picks you will enjoy these wines and marvel at the finesse of wines with such power. Mr. Asseo often uses Cab Sauv in his red wines and I appreciate this working outside of traditional boundaries. You don’t often see Syrah and Mourvedre blended with Cab Sauv and Petit Verdot in a wine, but in the hands of a master winemaker, the winery is able to encourage just the right contribution from each to make a harmonious whole. Mr. Asseo is also a block blender extraordinaire… with 58 acres separated into 40 blocks, each vinified separately, then blended… he has developed a system to coax the just the right character from each Micro-Terroir and has the palate to blend them properly. 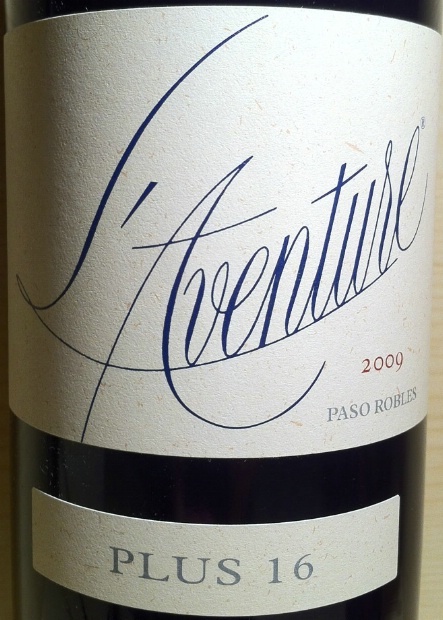 Virtually all L’Aventure wines are comparatively high in alcohol, but are well balanced and do not seem hot. L’Aventure wines are definitely priced within the premium space in the marketplace, but they are also one of the very few producers in this category that continually delivers on value. I enjoyed these wines with friends and was unable to take detailed notes, so I will only be able to provide general impressions. The group had a wonderful time and enjoyed the wine immensely. In my mind, it is always preferable to share a special bottle at a romantic dinner, or with friends! This wine was more “true” Southern Rhone in profile with 42% Mourvedre in the mix. A touch earthy in character (from the Mourvedre), with all of the beautiful blue and black fruit that they usually coax from their grapes. A slightly heavier mouth-feel, with great balance. A little lighter on the structure, even with 42% Cab Sauv. It is possible, the six years in a bottle have softened the tannins and acidity a bit. This wine is definitely in its prime drinking window, perhaps 2015-2017. If you have this in your cellar, don’t let this sit too much longer! Another “Wow” moment with an Estate Cuvee. A big, powerful red, with more structure than the Plus 16. Less earthy with no Mourvedre here, instead – a liberal dose of 16% Petit Verdot. An unbelievable 15.7% alcohol and you can barely tell it is an adult beverage. Soft, plush texture and a nice backbone. Just a gorgeous wine, drinking beautifully at five years in the bottle. Drinking window of 2015-2020, depending on your feeling about tannic structure. 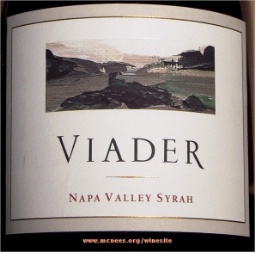 The Viader is a 100% Syrah blended from two different clones – Rhone and Barossa. I really enjoyed this wine, the others in the group, not so much. The drawback, the 14.9% alcohol was very evident. This Viader wine had a refined, silky texture that I thoroughly appreciated after the mouth-coating L’Aventure wines. This was right on its drinking window with wonderful black fruit, nice acidity and a good tannic backbone. Drinking window of 2013-2016. If not for the hot profile, this wine would have held its own against the two previously enjoyed. I will make an observation here that I have noticed many times previously. 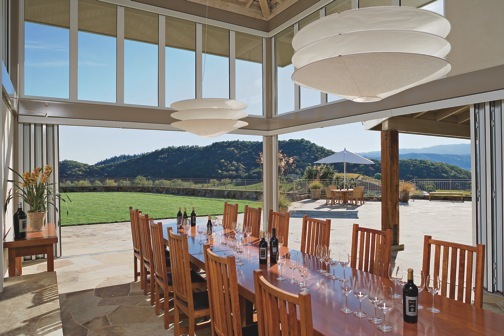 Napa premium wine producers better develop an understanding of the changing palate of the American wine drinker, or they will be left behind by other wine regions in the U.S. Hot tasting wines are losing their appeal. Realistically, the alcohol over-shadows any subtle flavors that might be experienced with the hors d’oeuvres, or an accompanying meal. Balance in a well-made wine still wins the day. If the winemaker goes big… he/she better have a deft hand at counter-balancing the hedonistic character of the wine. The Estate Cuvee was a gem! I was really looking forward to visiting Shafer on this trip. It was expensive, but I wanted to connect with the same winery that had produced those great vintages of One Point Five and Relentless. I envisioned writing this crazy post that would make you want to jump on an airplane right now and drive directly to the winery. 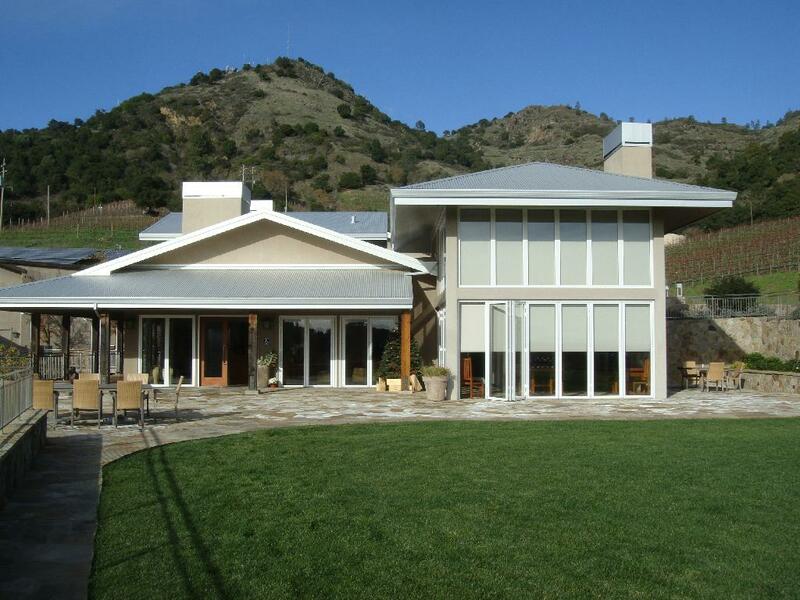 As you approach the winery, this is a hilly site that hits you with a luxurious feel of rolling vineyards. It was a gorgeous facility and the tasting room was well-appointed. The whole experience was just as the description sounds – expensive, stuffy, high-brow. My wife and I were tasting with a group of eight consumers. The group tasted the current releases, including the Hillside Select that had a retail price of $250/btl. I spoke to several in the group afterwards and they had already moved on, asking me to recommend other sites in Napa. Not that the wines weren’t good… just that the experience was not engaging and did not leave a lasting impression. For the price of the tasting and the cost of these wines, you would expect something different. The Shafer experience is a throw-back to an American wine experience long past. Today, even the wine drinker able to afford this collection, is looking for a more relaxed presentation. Lots of citrus on the nose with citrus AND tropical fruit flavors in front on the palate. The tropical fruit character was a nice change from other Napa Chardonnays. The lack of malolactic fermentation adds to the perception of very high acidity, which is a nice counter-point to the creamy mouth-feel. Very Old World winemaking here – lots of new French Oak and a full 14 months on the lees. A very nice Chardonnay and the second best wine of the day, in my opinion. Nose was a bit unusual with a floral character from the 6% Malbec. Once the carmelized butter hits the nose, you know where this is going… a rich, toasty oak experience. The wine is fruit-forward with typical plum flavors in front, but the mid-palate catches you off-guard with a very bitter and sharp dark chocolate flavor that makes the wine difficult to drink. Also, you would expect a little more mouth-feel from a high-end Merlot like this. The wine’s structure had high tannins and high acidity. The Syrah fared much better in the cooler 2011 year… as you would expect from a varietal that stands up to cooler temperatures well. Fortifying this blend with Petit Sirah adds plushness to the mouthfeel and deep color. Minty on the nose with lots of plum in front on the palate. The mid-palate moves to pleasant dark chocolate with a medium length finish. What I liked most about this wine was the character of the tannins. No grittiness, or bite… the mouth-drying tannins were very soft and smooth. The wine’s structure had high tannins and high acidity. This Syrah blend will age well. By far, this was the most enjoyable wine of the tasting. Very fruity plum on the nose with a touch of tobacco and menthol. A blackberry and plum fruit-forward palate with a very long, luxurious dark chocolate finish. Beautifully balanced with soft tannins and a nice acidic backbone. The wine was soft, but not particularly vibrant in the mouth. A very refined style and the best wine of the tasting. An excellent Napa Cabernet, but at $250/btl, difficult to justify the price. I wonder where the 2011 vintage will take them? In the past, I have purchased Shafer wines via wine brokers. The wines maintain value, but do not seem to appreciate much on the open market, so many 5-10 year old vintages can be acquired at roughly the same price as current releases. Without a feeling of connection to the winery, my future Shafer purchases will be based solely on QPR (quality to price ratio) and in most years, that will be a hard sell.